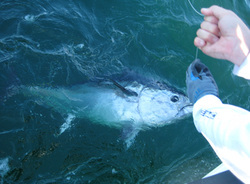 Bluefin tuna only spawn in the western Pacific, and often head east towards California following food sources. These days, they bring with them “low levels” of radiation. Along the California coast concerns that this is the result of the tsunami-damaged Fukushima nuclear power plant has many people worried. Scientists believe these were young tuna that left Japanese waters approximately a month after the power plant disaster, last year. A study published in the journal Proceedings of the national Academy of Sciences said, small amounts of cesium-137 and cesium-134 were found in fifteen tuna caught in the vicinity of San Diego last August. Researchers claim that although the tuna measured five times the amount of cesium-137 than normal, the radiation is not enough to harm people if eaten – and “far less” than general Japanese safety levels. Lead author, Daniel Madigan, of Stanford University's Hopkins Marine Station, noted that the amount of radioactive material detected was far less than the Japanese safety limit. "I wouldn't tell anyone what's safe to eat or what's not safe to eat," Madigan said in a telephone interview. "It's become clear that some people feel that any amount of radioactivity, in their minds, is bad and they'd like to avoid it. But compared to what's there naturally... and what's established as safety limits, it's not a large amount at all” said Madigan.